I put this graphic at the head of my home page shortly after 9-11-2001. I will keep it there until the first anniversary. 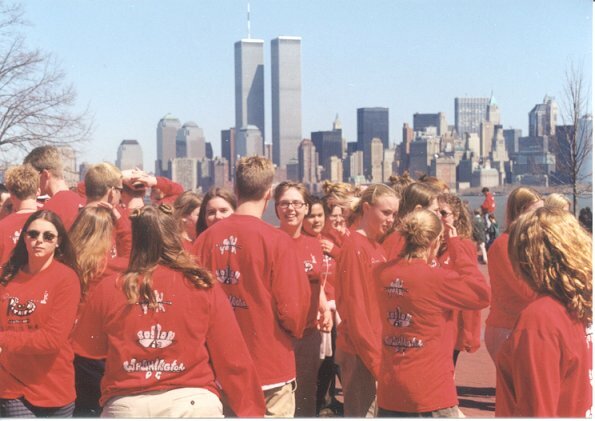 My wife and I met our daughter and the Duluth East A'Cappella choir in New York City at the Statue of Liberty in the Spring of 1999. This is one of the pictures I snapped. My daughter Keely sang some solos in the choir. You can download one of them as an MP3 at the bottom of the page. Her voice knocks my socks off. In Memorium for the losses in New York and Washington DC, Sept. 11, 2001. Remember how things were in better times.